My life as an artist has taken more twists and turns than some of my subjects! After starting as an abstract painter, I've morphed into a nature artist of a different sort. My focus is on uncultivated plants and creatures from the wild. And not just in their most beautiful states, but in all phases of their life cycles. Included are those overlooked, downtrodden ones often stigmatized as weeds or pests that many people would uproot or spray. 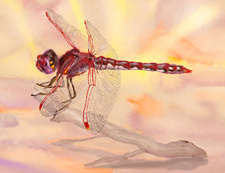 I dedicate my art to honoring and protecting them. At each stage of their life cycles, butterflies are often literally bound to specific host plants and flowers. 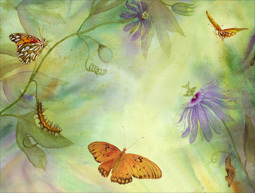 These butterfly and host plant life cycles have developed into my current favorite subjects. Beginning with local species of the Northeast US, I've taken to migrating like many of them from border to border. At first, the insects and amphibians that looked back at me through my hand-lens, or flitted and buzzed overhead as I drew, or called to me from the wetlands, were just distractions. With time, they became a favorite subject. Each poster is a collection of thumbnails of paintings that you will see in other galleries above. 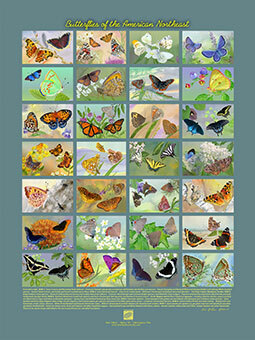 In each poster the text at the bottom identifies the subject and in the case of the butterflies it also identifies the food plant of the caterpillar…or what you need to have to attract them to your garden. Perhaps the most well known butterfly life cycle of all is that of the Monarch. 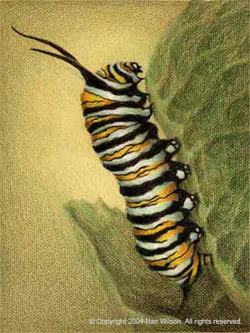 In this gallery that cycle is depicted in four separate images—Egg, Caterpillar, Chrysalis and Adult, each rendered in color pencil.